The Kaypark Pedal Cruiser 2 is a commercial grade pedal boat that is designed for heavy use and a long service life. The Pedal Cruiser 2 seats 2 adults or 2 children. Many mat and glitter colors available. Kaypark Pedal boats are built to the best rental pedal boats for sale. Optional canopy and factory installed stainless steel crankshafts are available. 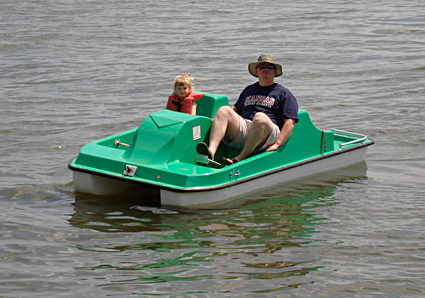 Kaypark pedal boats are built to order with variable lead times for delivery. Please check with us for an accurate lead time. The price of this item does not include truck freight (ships by semi) to your location. If this item is ordered online, before processing the order, we will obtain freight quotes to the shipping address provided on the order. We will email you the best quote for your approval. Tip: It is generally $30 to $50 less expensive to ship this item to a business address that has a loading dock or forklift.